The Eildons in the snow, taken today by Alwyn Johnston. 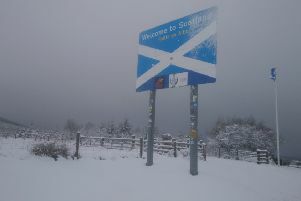 With intense snowfall expected over the region due to the winter storm tagged “the beast from the east”, Scottish Borders Council has made the decision to close all schools tomorrow (Wednesday). The schools are also likely to also be closed on Thursday as forecasters have placed an amber (be prepared) weather warning in place from 6am on Wednesday to 6pm on Thursday. The situation will be closely reviewed throughout tomorrow. Borderers are also being advised not to travel unless absolutely essential during the period covered by the amber warning, as given the logisitcal difficulties expected given the conditions, it is believed that some minor roads will not be cleared until at least Friday morning. Between 5-10cm of snow is anticipated widely during Wednesday and Thursday, with up to 25cm possible in places. By Thursday evening, this could accumulate to up to 40cm. Due to the strong winds, blizzards are likely, particularly over higher ground, as well as drifting snow. Some of the heaviest snow showers may also include some lightning. Tracey Logan, chief executive of Scottish Borders Council, said: “As a result of the forecast and on the advice of partners we have taken the decision to close schools on Wednesday. “It is highly likely that schools will also be closed on Thursday, although this will be reviewed throughout Wednesday and we will do all we can to provide support for senior pupils who are working towards exams. “With the potential for significant disruption to travel, roads blocked by deep snow, rural communities being cut off and interruptions to power supplies, we are calling on people to get themselves prepared now. “We would ask residents to make sure they are fully ready for the winter weather, and should keep up to date with the latest information by signing up for SB Alert, listening to local radio and checking SBC’s website and Facebook and Twitter pages. Scottish Borders Council’s Emergency Planning Centre will be open from 5am tomorrow to manage responses to the weather conditions, alongside partners including Police Scotland. Winter maintenance operations will continue throughout the period, focused on keeping main routes open where possible. However, the heavy snow predicted alongside the very cold temperatures mean conditions are expected to be challenging and drivers should consider if their journey is necessary. Due to the expected snowfall it is highly likely that minor routes and many footpaths will not be cleared or treated until Friday at the earliest. Chief Inspector Andy McLean, Police Scotland’s local area commander, said: “The Met Office has highlighted to us that there will be a significant impact on travel and communities where the heaviest snow falls over the coming days, and I would reiterate the advice that people should only travel if absolutely essential, and should make sure that they are fully prepared for the conditions they may face, including having sufficient fuel and supplies such as warm clothing, food and water. Anyone able to provide care for family or friends during the severe weather this week is asked to contact the client’s care provider directly, or failing that SB Cares on 01896 662701.